2 Why People Think It’s Bad? 3 But There Are Limits! In most of the tropical areas, coconut is seen as an important source of food. Coconuts and Western Pacific go a long way back too and people in the region have always loved them. Some people simply avoid coconuts because of their thick exterior but once you smash it open, the coconut flavors prove to be totally worth all that hard work. There’s always a bit of apprehension about eating coconuts though even if it has already been cracked open with many people asking: is coconut good for you? Let’s find out if it is. Coconut oil has a variety of fatty acids with there being quite a mix of medium chain fatty acids and short chain fatty acids. Lauric and myristic acids are the ones in majority as coconut oil contains 44% lauric acid and 16.8% myristic acid. Coconut water delivers a lesser amount of calories and sodium when compared with a sports drink and the potassium gained with coconut water is high. When comparing Gatorade (a sports drink) with coconut water on an ounce per ounce basis, coconut water delivers 5.45 calories to Gatorade’s 6.25 calories. Moreover, coconut water delivers 61 mg of potassium and 1.3 g of sugar as compared to Gatorade’s 3.75mg potassium and 1.75 g sugar. Totally pure coconut oil (the one in which hydrogen isn’t added to make it hard) consists of 90% saturated fat. Every type of fat actually delivers the same amount of calories. A single tablespoon of coconut oil delivers 14 grams of fat, 12 grams of saturated fat and a total of 117 calories. Coconut milk also delivers a lot of calories with a cup of it containing 445 calories. Not just that, a cup of it also contains 48 g fat (with 43 g saturated fat). It helps in preventing tooth decay as coconut oil is capable of fighting away the bacteria that causes tooth decay. Coconut water has various nutritious qualities as it contains a lot of electrolytes and potassium. Coconut water is actually a great alternative in order to keep your body fresh and hydrated when compared with energy drinks that contain artificial sugar. Coconut milk can help in boosting the immune system as it is very rich in lauric acid. It promotes cardiovascular health by keeping the good cholesterol levels high and bad cholesterol levels low. It is great to overturn malnutrition as it is easily digestible. 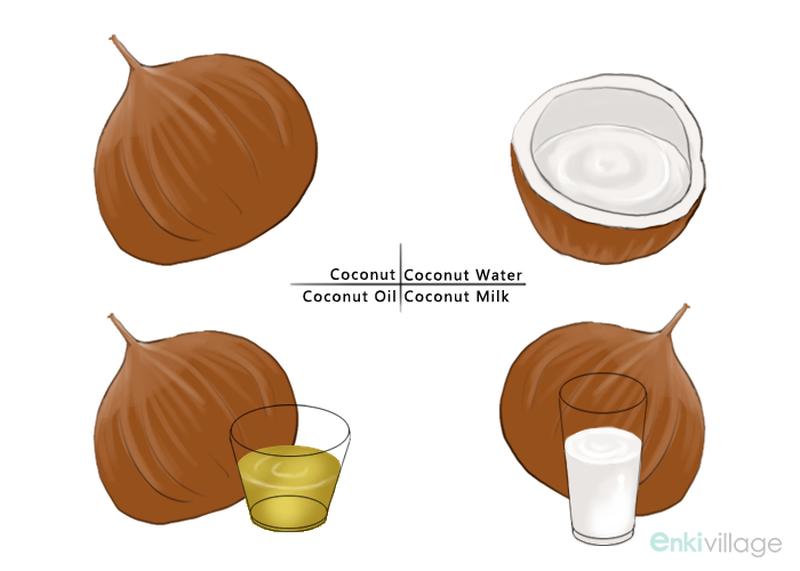 Since coconut contains fatty acids which have great antimicrobial qualities, it is capable of killing bacteria, yeast and fungi which can cause various diseases. It slows down the release of sugar in the bloodstream and thus, is useful for diabetes. It helps in avoiding brain disorders like Parkinson’s. Improves the metabolism and increase energy levels as it is burned by the body rather than kept as fat. Coconut oil is great for usage as cooking oil as it stays stable even at high temperatures and thus, doesn’t get denatured. Coconut oil proves a great alternative to butter and can be used in making smoothies and desserts too. Why People Think It’s Bad? People actually used to question things like is coconut good for you or are coconuts good for you because even butter contains less saturated fat than coconut in an ounce for ounce comparison. However, the answer to the question what is coconut good for is actually that even with all that saturated fat, overall coconut improves cardiovascular health. One of the reasons for this is that the half of the saturated fat is made up by lauric acid. Lauric acid has been proven to improve the good cholesterol level and thus, it boosts your cardiovascular health. The other reason for this is that the remaining percentage of saturated fat is made up of medium chain group of fatty acids and they hardly have any effect on the health of your heart. Since coconut water contains less sugar as compared to sports drinks and sodas as well as a few fruit juices, it is a great drink for children and adults who prefer their drinks to be less sweet. However, there is a limit to the consumption of coconut water too as a single 11 ounce glass of coconut water delivers around 60 calories and you must keep that in mind when drinking more than a glass of coconut water in a day. Coconut oil is neither better nor preferable over any other kind of saturated fat according to American Heart Association and according to the 2010 Dietary Guidelines published by US Government. Both the 2010 guidelines and AHA actually recommend limiting the use of coconut oil (any saturated fat for that matter) to around 7 to 10% of your total calorie intake as excessive usage can pose a heart risk. Researchers actually believe that while coconut oil is preferable when compared with Trans fats and butter but it is not as great for health as vegetable oils. So, the answer to is coconut good for you is yes but when its use is limited.